Having worked within the construction industry for over 20 years, we have a strong understanding of our obligations to Clients and our approach identifies and retains the Clients key requirements and success criteria as a priority. We pride ourselves on our track record with many of our Clients, a true reflection of our focus on the delivery and standard of service we have and continue to provide. Offering full joinery services to large national companies, we also specialise in complete building packages including kit manufacture, to private individuals or independent developers a like. Always at the forefront of our Managing Partners thoughts is the welfare and health & safety aspects within the industry. 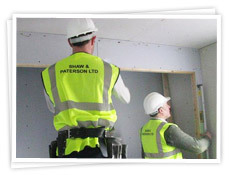 All our operatives are CSCS registered, face fit tested and fully qualified to undertake their responsibilities.